12/13/2016 - Here's a vertical cycle of cards featuring deathstroke, a sort of undying or automatically triggered unearth. I had wanted to use "The first time ~ would die, instead sacrifice it after your next combat step" but since we're not resetting the creature by changing zones, we have to use regenerate's damage removal clause. A benefit of that is we avoid confusing behavior where you can sacrifice it to pay costs twice. It took me a while to figure out "at the end of your next combat step." Upkeep didn't work because that would only let you block with it after it dies on attack. "Until your next end step" didn't work because that would only let you attack with it after it dies on defense. This way, it can die on attack or defense, and either way it gives you one last attack (and might give you one last block too). This could definitely also be red. Design a red deathstroke card in the comments. At first I read this as "your next end of combat step" and thought "well, that sounds pretty pointless." (It should say "phase".) Living for another turn makes more sense. Might want to use some kind of marker to indicate deathstricken creatures versus non? Will players grok that their next combat phase happens next turn even if they don't attack with anything? 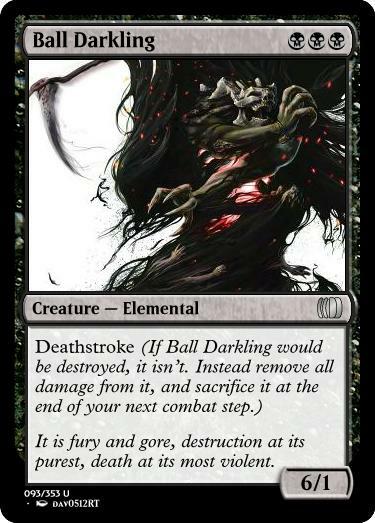 CARDNAME has deathstroke as long as it damaged a creature this turn. Sacrifice two creatures: CARDNAME can't be sacrificed this turn. I still get phase and step confused. The hope is that the death will be significant enough to remember, but it absolutely adds memory load. I'd want to playtest before baking something in: Maybe players just mark it off the books, like putting a coin on your library to remember upkeep effects. 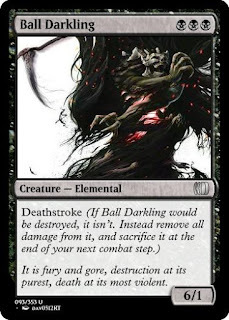 I expect some players would think they can keep their creature longer by not attacking. Question is how many? Hoping 5% or less, but that's clearly a shot in the dark. I love must-attack with deathstroke. Nice. Deathstroke conditional on damage is neat. The sack two creatures to keep our rare alive feels like a black demon to me. I like the idea, but I'm worried the current text is hard to follow. Would "sacrifice at the end of your next turn" be clearer? I'm also worried about memory, if it dies this combat, it's hard to remember to sac it next combat. I wonder if it could be marked with a +1/+1 counter or something? Or instead of surviving itself, it could create a token with "sac this at..."? At Eot isn't specific enough, unfortunately. Never make tokens when you can use cards. Just note it's dead with a marker of some sort. "Never make tokens when you can use cards." Thinking more, maybe a whole extra attack was too much, maybe it should be, "sac at the beginning of your next upkeep". That's more in line with existing memory cards (there's quite a few "don't untap" and "until your next turn" etc, but very few beyond that)? That gives you an extra block, which isn't as exciting, but it does mean, if you *need* a blocker, you can still attack first. And then use the doomed create for a sac cost or a block. All the bother isn't worth it without the payoff of an extra attack. "If ~ would die without a deathstroke counter on it, instead put a deathstroke counter on it, remove all damage from it and sack it after your next combat phase." "At the end of combat on your next turn." might be better wording. Worth noting that with a bit of reflavoring (e.g. "last stand"), especially if it only cares about combat, this ability could easily be White. I agree completely about a new name and white. Your wording is good too. Seconding (thirding?) the concern about memory issues. Maybe it would be easier to remember if the card exiled itself until your next turn? But that's six lines instead of four, and doesn't allow blocking, so . . . probably not. Incidentally, I think this mechanic could also fit in Green or White (maybe renamed "vengeance" or "tenacity" or something.) Unearth felt red, at least to me, only because of the whole "mill/discard into a ball lightning out of nowhere" possibility. Since Deathstroke requires the creature to die first, it reads as less "surprising" and more "hard to kill," which I feel is more Green and White's shtick than it is Red's. 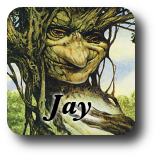 CARDNAME must be blocked if able. When CARDNAME dies, put two +1/+1 counters on each other creature you control that attacked this turn. I agree this could be green or white too. 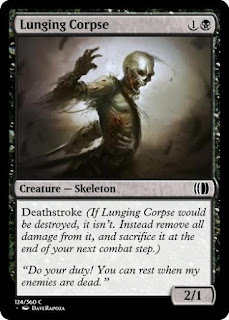 Vengeful Crusader is confusing because you only get the counters once, and only after its "delayed death." If this could be four colors, could it be five colors? Could it stand alone akin to persist/undying as a minor mechanic for an entire set? I think that there is probably enough design space to do so, but thought it might be a fruitful discussion and I'd be interested to hear various artisans' thoughts. It could work really nicely on, say, an Arthurian/Camelot inspired plane to further a heroism/mythic feats atmosphere. 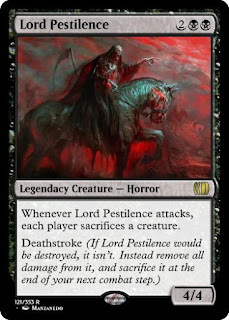 Or perhaps a return to Theros, replacing heroic?